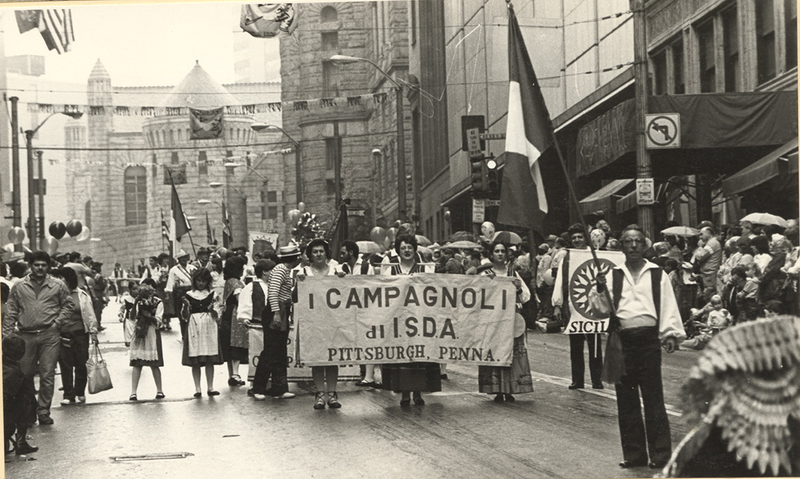 I Campagnoli marching in a parade in downtown Pittsburgh, 1980s. I Campagnoli Papers & Photographs, Detre Library & Archives at the History Center. Gift of Mary Ferro. Musicologist Alan Lomax stated that “the first function of music, especially of folk music, is to produce a feeling of security for the listener by voicing the particular quality of a land and the life of its people.” Apropos that the Italian Sons and Daughters of America’s folk music and dance troupe would call themselves I Campagnoli, which translates to “of the people” in English. Beginning in the mid-1960s, Pittsburgh’s premiere Italian folk troupe traveled the Mid-Atlantic region and beyond and cultivated a following of thousands as they performed in the dialects of Northern, Central, and Southern Italy, as well as Sicily and Sardinia. 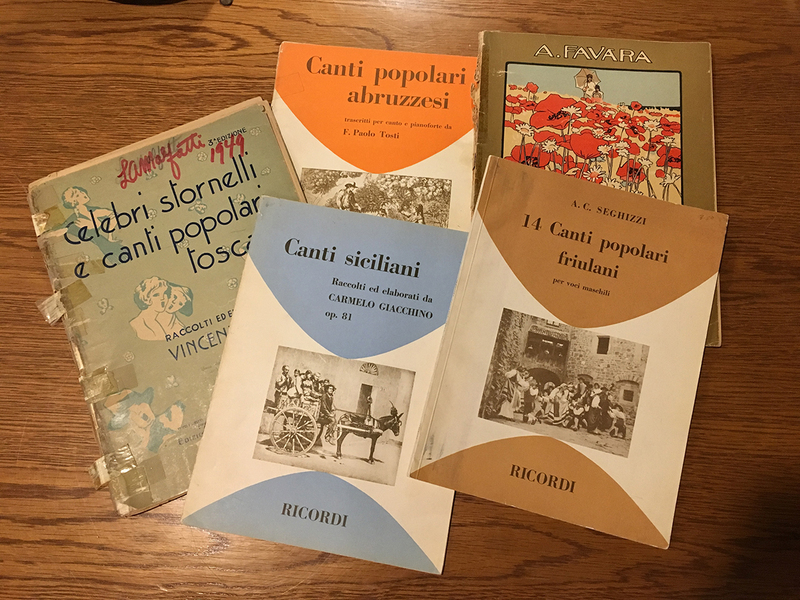 More than just purveyors of pure entertainment, the members of I Campagnoli recognized their role as the keepers of “at-risk” traditions; they were acutely aware of the loss of Italian language skills among the descendants of Italian immigrants and the loss of dialect and folk customs of Italy. Their canon embodies a pan-Italian sound that could have only formed in the Italian diaspora and their live performances offered an escape for their immigrant fans that longed for the sounds of their homeland. 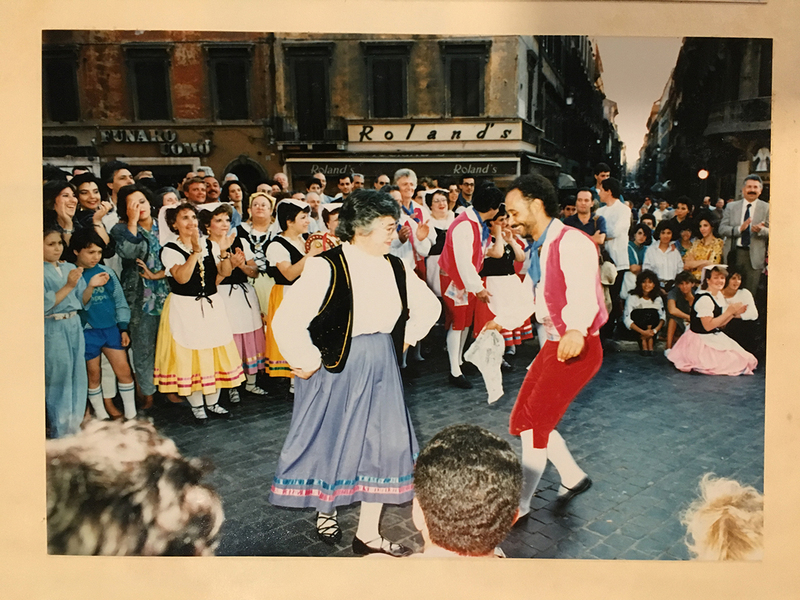 Jane Ferro and Blaise Panizzi dance in a piazza in Italy, 1987. I Campagnoli Papers & Photographs, Detre Library & Archives at the History Center. Gift of Anna Marie Fiori. Since 2015, I have conducted fieldwork to document the history of I Campagnoli in the Senator John Heinz History Center’s Italian American Collection. This production has yielded a collection of costumes, instruments, sheet music, member scrapbooks, video and audio recordings of performances, and other ephemera produced by their members. I also conducted oral history interviews with a dozen former members to preserve individual voices. 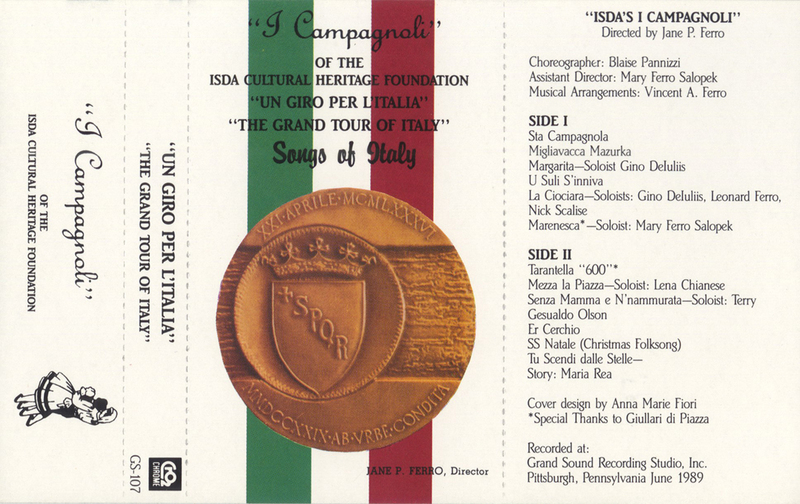 Seminal moments from their five-decade history are recalled in this aural record including their 1965 debut performance at Heinz Hall, performing at the Italian Pavilion’s grand opening at Walt Disney World’s Epcot Center in 1982, the “Best of Italy” tour in 1987, and performing for Luciano Pavarotti in 1994. 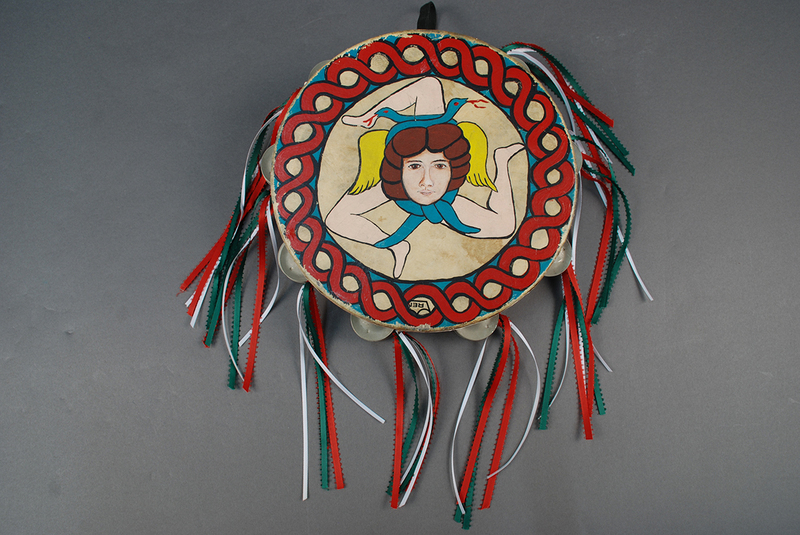 Hand painted tambourine used by I Campagnoli members, 1980s. Heinz History Center Collections, gift of Anna Marie Fiori. Liner notes from an I Campagnoli cassette tape, 1980s, gift of Mary Ferro. I Campagnoli Papers & Photographs, Detre Library & Archives at the History Center. Gift of Mary Ferro. Sheet music collected by I Campagnoli former director Lorenzo Malfatti, 1960s. I Campagnoli Papers & Photographs, Detre Library & Archives at the History Center. Gift of Mary Ferro. 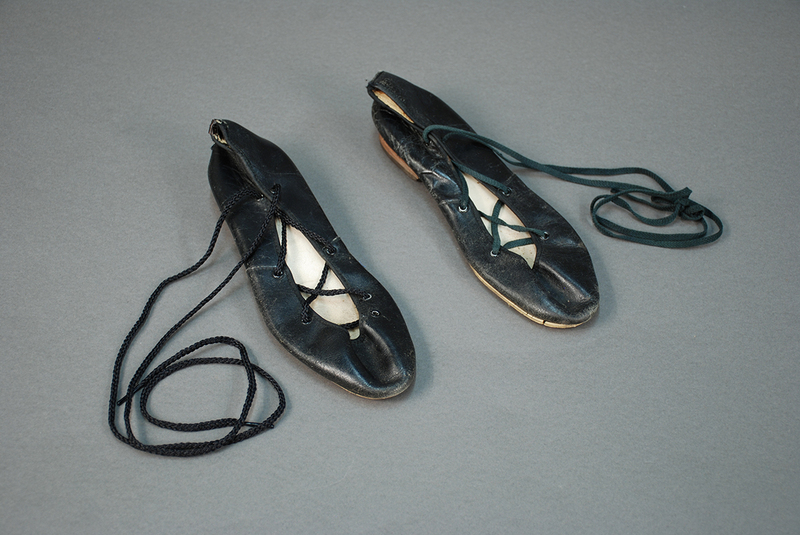 Mary Ferro’s dance shoes, 1980s. Heinz History Center Collections, gift of Mary Ferro. 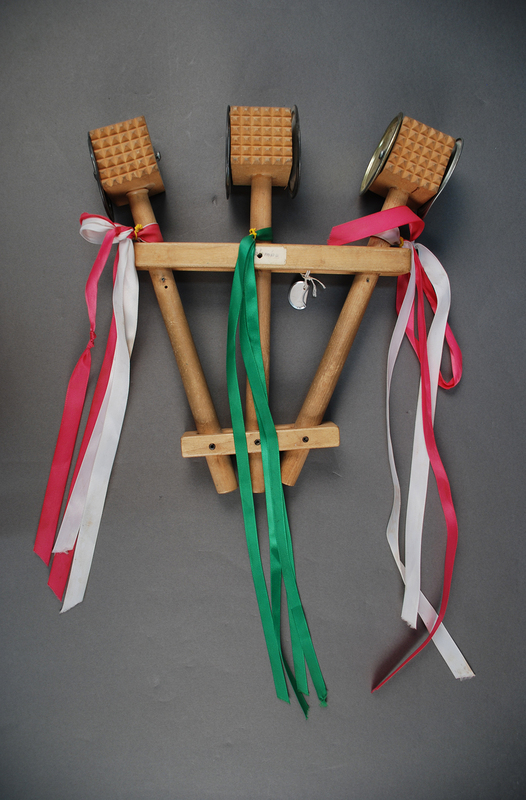 Dominic Palombo made this homemade triccheballache, a Southern Italian instrument made of wooden mallets that clack in a rhythm, 1980s. Heinz History Center Collections, gift of Anna Marie Fiori. A special thanks to Angeline Collura, Joseph D’Andrea, Mary Ferro, Dolly Capparelli Ferraro, Anna Marie Fiori, Osvaldo Fontecchio, Virginia Greenaway, Adeline Makar, Blaise Panizzi, Mary Pat Petrarca, Nick Scalise, and Ann Tambellini and all their efforts to document I Campagnoli in the History Center’s Italian American Collection.